The 29 guestrooms at the Hotel Mirabeau Eiffel can accommodate up to 4 people and are available in 4 categories : Classic, Comfort, Superior and Family. Two of the rooms are equipped for people with reduced mobility. All rooms are decorated in a contemporary style and feature a private bathroom, LCD TV, WiFi, minibar, safe and direct dial telephone. Perfect for those traveling either solo or as a couple, the Classic rooms at the Hotel Mirabeau Eiffel offer our guests comfort and functionality. You can choose between the Double and the Twin version. 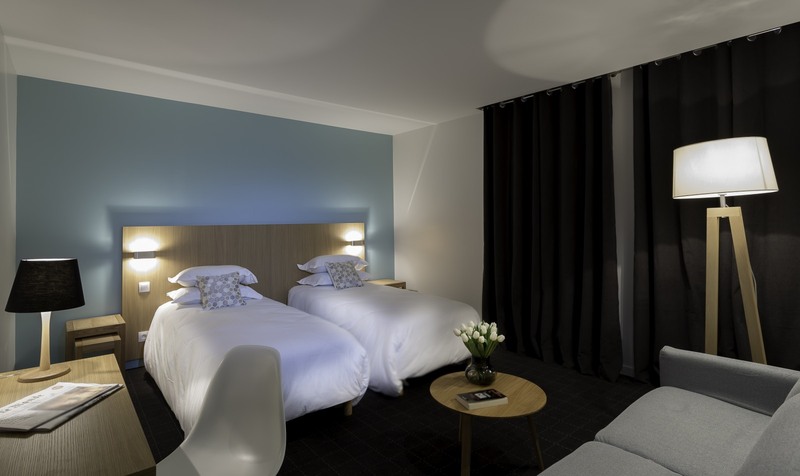 Offering plenty of ease and convenience, plus a little more living space, the Comfort Rooms of the Hotel Mirabeau Eiffel are available in Twin and Double versions. All Superior rooms at the Hotel Mirabeau Eiffel are air conditioned and feature a comfortable sofa. These large rooms boast features which can be shared, such as a corner bath and a small veranda. * (except for the "Veranda" room. Please inquire when making your reservation). Ideal for all those who wish to discover Paris with their children, the Hotel Mirabeau Eiffel Family Rooms are equipped with a double bed and a sofa bed so they can easily accommodate four occupants, large or small, in complete comfort.